You may be asking yourself what 'damage control' really means. To sum it up, our modern lives are full of stress, nutritionally-deficient, over-processed foods, and not enough time to attend to our fitness and health. 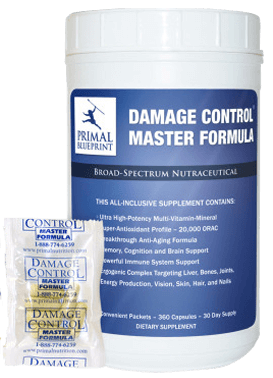 Damage Control Master Formula is a supplement that helps you fight all these negatives and fill in nutritional gaps. This comprehensive formula includes everything needed to ensure you are getting what your body really craves. A multi-vitamin formula with E, C, and B vitamins works with essential minerals to support immunity, nervous system health, and nearly every part of your body. High-quality CoQ10 and other antioxidants rid your body of toxins and help support your heart and lungs. This formula helps your entire body work in-sync, aiding your bones, joints, eyes, and stress-response. Since this product is developed by Primal Blueprint, it is designed to complement Primal Blueprint plans and only contains the purest of ingredients. Since it contains everything you need, you will save money and hassle by choosing this one product. Ditch your shelf full of supplements and choose this research-backed formula to easily enjoy optimal health. Looking for a less expensive alternative? Check out Primal Damage Control.This formula is designed to mimic the more expensive Damage Control Master Formula and omits the most expensive ingredients while still offering exceptional results. Since October 2006, Mark Sisson has been publishing on MarksDailyApple.com, a free blog that offers health articles, a weekly newsletter, and a thriving support forum with over 375,000 followers. Mark conducts seminars on the Primal Blueprint way of life, including "PrimalCon" retreats in California. Mark Sisson is a former world-class endurance athlete who has been promoting ancestral health principles and related recipes. Amazon.com shows his books rating at 4.5 or higher, including the best-seller of The Primal Blueprint in 2009. The Primal Blueprint is a lifestyle philosophy that includes diet and exercise, as well as community support and supplements to assist in weight loss, restore energy and achieve peak performance. Primal Blueprint offers a 30-day money-back customer guarantee that will refund your original purchase price. Order auto-ship and get free shipping. Primal Blueprint operates in Malibu, CA, and the website was established in 2009 (12 years	ago). Looking at the website, it's unclear what the shipping fee is for US domestic or international rates. Damage Control Master Formula is not available at local retailers and must be ordered online. There is no mention on the website if ingredients are grown with ecologically friendly cultivation methods or practices Good Manufacturing Practices (GMP) regulations. Ingredients are not certified organic or non-GMO (genetically modified organisms). Primal Nutrition offers packages with several products that help you save up to 40% off if you bought the items individually. Best-Selling: Primal Essentials Kit - 3 of the most essential supplements to a healthy life: Primal Flora, Primal Sun, and Vital Omegas. Platinum Package - Damage Control Master Formula, Primal Fuel, Primal Flora, Primal Sun, and Vital Omegas. Gold Package - 30% off the regular retail price - Primal Damage Control, Primal Fuel, and Primal Flora.